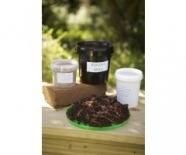 Choosing a container: surface area is more important than depth, ideally a wormery should only be about 18 inches deep. 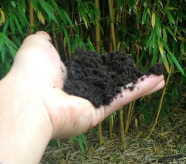 This is because composting worms tend to feed upwards, bedding can compact down in a deep container and push air out of the bottom layers making them anaerobic. Worms will eat about half their body weight in food a day so 1kg of worms will eat about 3.5kg of food a week. The greater the surface area you can provide for them the better, the ideal ratio is 1kg of worms per square foot surface area. Wood or plastic? Wooden bins “breathe” more than plastic bins but they deteriorate more quickly because the wood is always damp, they are also heavier and therefore difficult to move and they cost more to make. It is usually possible to find an old plastic container that can be adapted for use as a worm bin. 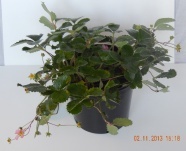 · The wood will need to be treated with a wood preservative such as cuprinol. · You will be making a wooden box with a lid. When you have decided on the size you want, (1m x 1m x 0.5m deep would be big enough for a large family or a small school) give the dimensions to a timber merchant who will be happy to cut the pieces of timber to the required size. · The wormery should not rest on the ground; raise it by using slabs of wood or bricks or by giving your wormery feet. · Drill drainage holes in the bottom, at least 6 x 1cm diameter holes. Worm bedding is multi functional. It provides a safe environment for the worms to live and holds water; it can also be used to bury the food waste. The cheapest bedding is shredded paper or hand shredded newspaper. You will need at least 2 inches depth of damp shredded paper. Alternatives are coir or horse manure. Whatever medium you use add a handful or two of soil. This provides some grit to aid the breaking down of food waste in the worm’s gizzard. It also introduces inoculums of a variety of soil bacteria, protozoa, and fungi which will aid the vermicomposting process. Worms can be bought from worm breeders or from bait shops. The commonest worms used for composting in the UK are Dendrobaena and Eisenia fetida. 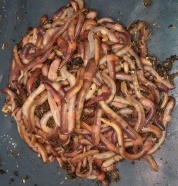 A lot of worm retailers only sell Dendrobaena as they are the easiest worms to breed, they are good composting worms but if possible it is better to use a mix of Dendrobaena and Eisenia as they have slightly different likes and dislikes and a combination of the two provides the best of both worms. Before buying worms check out their provenance – it may sound silly but many retailers import their worms and they don’t always travel too well. It is also worth checking if the worms come with a good supply of bedding or if they are being sent ‘dry’, with a coir block for you to make up your own bedding. 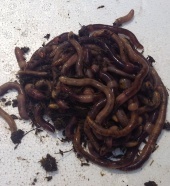 Worms travel better if they are sent in bedding and they settle down better in the wormery.